When it comes to surviving on your own, whether it’s camping or you’re bugging out to get away from society, there’s one instrumental tool you should have with you at all times, and that is paracord. This handy rope has proven to be very useful and versatile, accomplishing many tasks that you’d need several other tools for. There’s a reason more and more people are wearing those fashionable paracord bracelets that you see in outdoor sporting goods stores. That’s because this small, light, and unobtrusive tool can mean the difference between life and death. If you’re not familiar with paracord, then this article will show you the many paracord bracelet uses that you’ve probably never considered before. Also called 550 paracord, this handy rope is capable of holding as much as 550 pounds of tension. That’s a lot, and that’s why it’s so perfect to handle many of the tasks you need to accomplish while camping. Originally used in the making of parachutes, these cords have provided many services to outdoorsmen who focus on carrying as little with them as possible to minimize the heft of their gear. 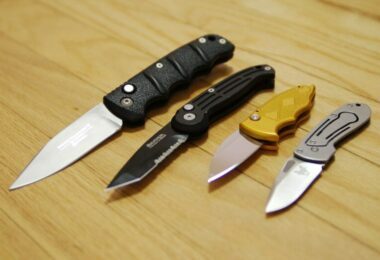 Thankfully, paracord is very light, but you do need a lot of it to take care of a lot of tasks. It’s useful for more than serving as a climbing rope; you can use it to tie a splint, to fish, or to tie your gear up together so that it’s not spilling out all over the ground. This is only a short list of the things you can accomplish with paracord, and this article is designed to teach you how to use a paracord bracelet in order to maximize its benefits. Check out our tutorial guide on how to make a paracord bracelet for you and your loved ones. If you’re an avid hunter who likes to use the more traditional methods of hunting, then you know how necessary your bow can be. However, your bow string isn’t designed to last forever, and accidents can happen that lead to it breaking. For your sapling, you should choose a dry piece of hardwood, and cut a piece of 550 paracord for your string. String up your bow as you would and see how it bends; remove the string and tiller the limbs of your bow in order to increase your accuracy. Tillering is the process of altering the lengths of each arm of the bow to create a balance; typically, bows are tillered to have a stiffer lower limb, as this is the part that you hold. The belly of the bow (the middle part) should be carved in order to match the bend when it’s strung. For the arrows, you can undo the 7-strand core of your paracord to create a fletch, along with the feathers. Fletching is the means by which your arrows will sail straight and hit your target. After you’ve fletched your arrows, sharpen the points and cut a nock into each. If you’re not very good at aiming with a bow and arrow, then you might want to consider building traps to help you catch your meals. In a survival situation, having traps set up means that you can spend time taking care of other tasks as well, such as setting up your shelter and looking for bodies of water. Your paracord can be used as snare nooses or triggers for other kinds of traps, and won’t wear away in even the worst of weather, so it can be used again and again. First, you should look for food sources that your prey is going to be attracted to. Set up your traps in these areas to make it more likely to catch them, and be careful not to leave any of your personal belongings behind. If an animal senses that you’ve been around or sees signs of your presence, you can minimize your chances of catching a meal. One of the most essential things you’ll need in the wild is a source of heat, not only for keeping you warm, but for cooking your food as well. It’s also been shown that the presence of a fire can help to keep morale going, so you won’t succumb to negative thoughts as you struggle to survive. Your paracord can be used as a suitable bow string when using the bow-and-drill friction method. The nylon in paracord provides a slippery surface that makes it easy for you to use the bow. Simply choose from dry, dead softwoods to serve as your drill and board, and some dried leaves and small twigs as kindling for your fire. Find a good curved piece of wood to serve as your bow, and tie your paracord to both ends, making sure that it’s taut. Use another thick piece of wood and to serve as your drill and wrap the cord around it. Then, using a rock, weigh down your drill against your board and move the bow back and forth. Increasing the speed will crate more friction, and it should start smoking in no time. Add your kindling to get a fire going, and then gradually add larger and larger pieces of wood to maintain your flame. Above is a helpful video on building your bow and drill, as well as the method used to get your fire started. Accidents do happen, and it’s important to be prepared for whatever may come your way. Your emergency medical kit is a great thing to have by your side, but it’s not going to have absolutely everything that you need, especially if your injury is quite serious. Paracord is there to save the day, however, as it can be used as a tourniquet, as well as fashioning a splint against a broken bone. 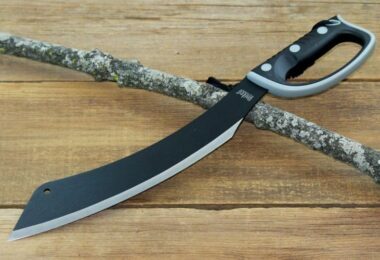 A tourniquet is very useful if you get a deep cut that results in severe bleeding. Bandaids aren’t going to help you, so you need some way to minimize the bleeding until you can find professional medical attention. Just tie the paracord tightly around the affected limb in an area that is closer to your core where your heart is. If you’ve broken your leg or your arm, you’ll need some way to keep the bones aligned to minimize any damage that can occur while you travel to seek help. Create a padded area around the affected limb and add the stiffening supports (flat pieces of wood work best). Then tie everything together with paracord to ensure that the limb is as immobile as possible. Paracord is also very useful and making slings, which provide support to injured arms. Find whatever material you can (preferably a shirt or some other article of clothing) and wrap it around your arm. Tie the paracord around your body so that it goes over one shoulder, around your back, and goes over the front of your injured arm. It should be tight enough to keep the limb as close to the body as possible and provides added support to reduce the stress on your shoulder. Lastly, paracord is great rope when you need to bring an injured or unconscious person back to a safer area. Building a makeshift stretcher can get you back to camp or civilization quickly, without risking injury or wearing you out. It’s a lot easier to carry a person on a stretcher than it is carrying their full weight, since you’re pulling on a larger surface area without all of the weight being on your arms and back. 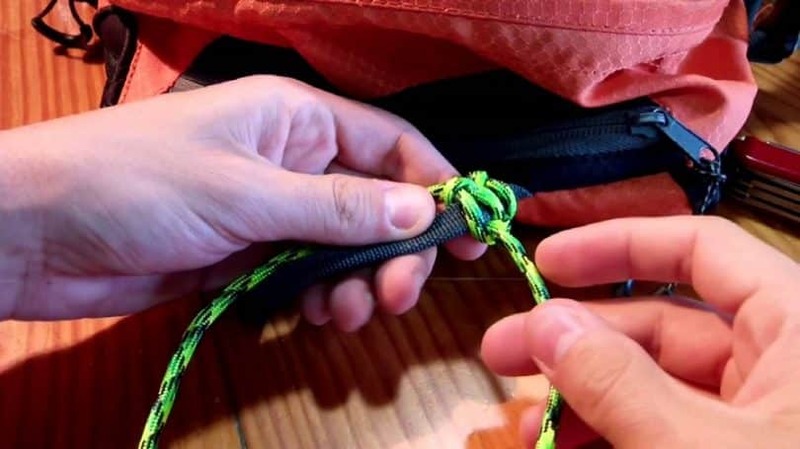 Tie your paracord through the ends of a tarp, gently place the person onto it, and grab onto the paracord. Then walk as you pull on the paracord. Travel will be slightly difficult, given the uneven terrain, but trust us when we say you’ll get there a lot faster. Also, first aid medical kits are important, our article on this topic is a must-read. Regular camping tents are built to be strong, but if you don’t place your tent poles deep enough or you’ve forgotten your guylines, you may be out of luck. Thankfully, with some paracord, you can take care of the problem without breaking a sweat. Undoing your paracord can provide you with a lot of strands that can be used to help you tie up your shelter and keep you dry. Simply tie the paracord between two trees and throw your tarp over it. You can use the extra bits of cord to tie the ends of your tarp to some nearby saplings in order to keep it in place and provide you with roomier shelter. And if you want to make an improvised hammock, simply tie the ends of your tarp up to a pair of nearby trees, and you have somewhat comfortable means of taking a nap. Didn’t bring your fishing pole? You won’t have to worry if you’re got a good length of paracord with you. It may not be the most effective method of catching fish, but when you’re in a pinch, it’s better than nothing. Unraveling the outer core of your paracord should reveal the thin, white cord in the middle. 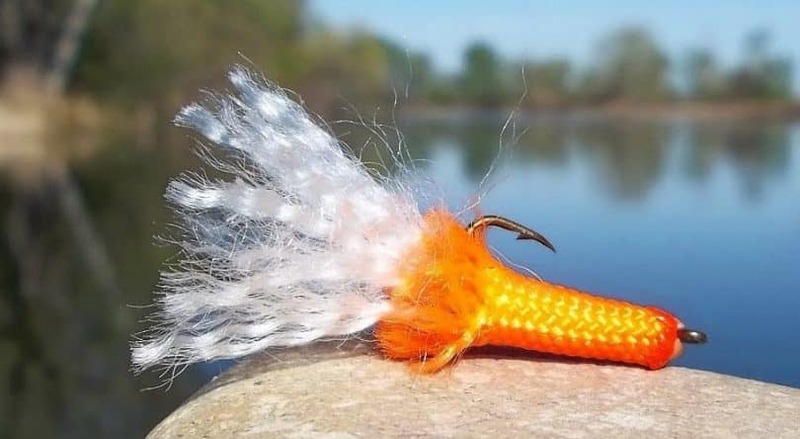 Melt the ends so that they don’t fray, and you can tie some small bait to the end to attract your fish. If you already have fishing line, the bright colours of your paracord are easy to spot, so you can gig up your catch as you continue fishing for more. Gathering more food before heading back to your camp is the best way to ensure that you’ll always have something to eat. Simply thread the paracord through the fish’s gills, and tie it to a secure source in the water, using either a basic hitch or slipknot. Then, pick it up later when you’re heading back to camp. If you’re extremely crafty, you can even use your paracord to fashion your own net. It may take some trial and error to get the knots right, as well as making the holes small enough to catch any decently-sized fish. But when you’re living out in the wild, taking the time to fashion your tools properly will make all the difference in the world and will help to yield bigger rewards so that you won’t succumb to starvation. It’s best to use the inner cords of your paracord to make your knots finer and more secure. It’s best to keep a lighter in hand as well to melt the ends and stop them from fraying. 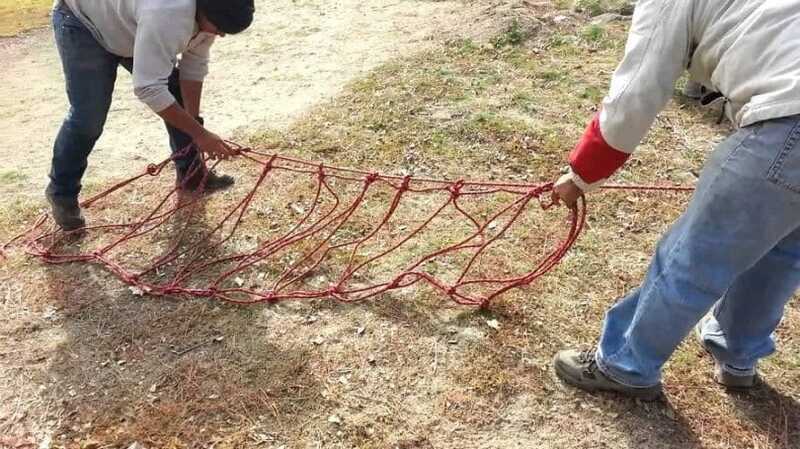 Above is a very handy video on constructing your own net out of paracord. It’s inevitable that your stuff is going to break at some point, since nothing lasts forever. It could be a buckle on your backpack, the shoelaces on your boots, or the seam on the back of your pants. As inconvenient as that is, paracord can take care of all your problems by being a source of raw materials to stitch your gear back together. It’s extremely versatile that you may have difficulties coming up with a predicament that it can’t fix. The great thing about paracord is that it is sold in bulk, and is available in a wide variety of colours to suit your style. This way, you can learn to make your own paracord bracelets if you’re not interested in buying the ones in the store. Not only does this provide you the skills you need to build your own paracord bracelet from scratch, but it can also become a fun hobby that keeps your mind occupied and reduces any stress you may have in your life. And with the large number of various knots that you can learn, there’s no end to the intricate and fun designs that you an use in making your paracord bracelets. 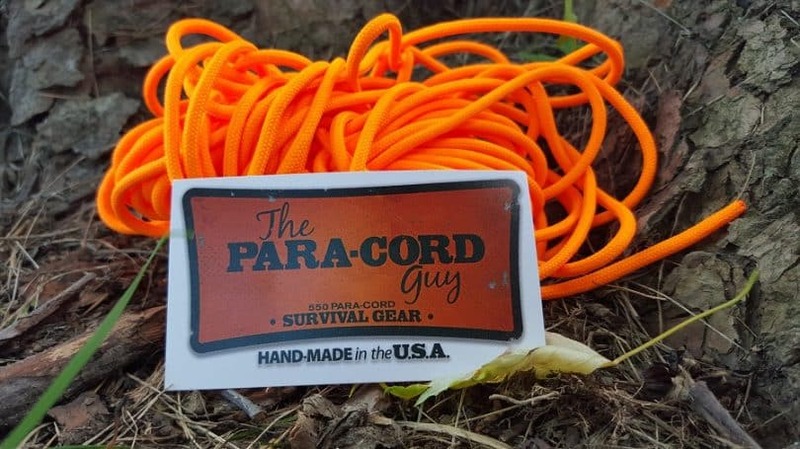 See our article on the different uses of the paracord for survival, it’s a must-read.